West Windsor, N.J. – When the Philadelphia Flower Show (PFS) opens on Feb. 28, students from Mercer County Community College’s (MCCC’s) Horticulture Program will be ready. According to Associate Professor Amy Ricco, they’ve been ready since the final day of last year’s show, when MCCC participated for the first time since the 1970s and won the award for Best Achievement in Imagination. Ricco observes that Disney’s Sorcerer’s Apprentice provided fitting inspiration. “Horticulture is a career where studying through an apprenticeship is a key ingredient for learning,” she said, adding that approximately 500,000 apprentices in 800 different occupations are registered with the Bureau of Apprenticeship and Training each year. The work on Mercer’s display started in December with topiary frames constructed by sculptor Carl Hagerty, who also created last year’s hit parade of insect topiaries. Also returning to lend a hand with the topiaries is MCCC Horticulture alumnus Chris McCarron '76, landscape manager at Sesame Place. In an effort to increase ground cover and other foliage, Ricco turned to two local greenhouses. “We needed to know what plants would grow in the worst weather months. Dave Voorhees, the owner of Voorhees Greenhouses LLC in Hightstown, helped us with plant selection and invited students to work with him at the greenhouse so that we could purchase the materials at a reduced rate. He has been very generous with his time and materials,” she said. Pleasant Run Nursery in Allentown is providing shrubs and perennials. The display, which measures 23 feet by 33 feet, will be divided in half – the hat and brooms will be busy making magic on one side, while the teacher and students will be making a garden come to life on the other. The brooms will add action as they pour water and carry buckets. Ricco says the moving parts required technical expertise outside her field. She approached long-time facilities staff member Rich Miller for advice, and shortly thereafter a group of four employees had stepped up to work on the project. 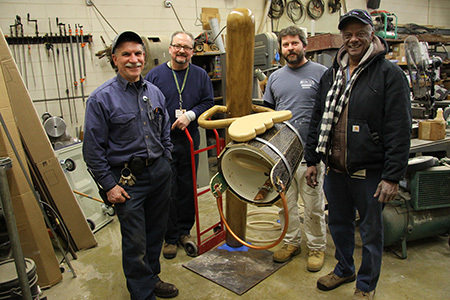 Miller is handling the electrical elements; Bob Bowman made the buckets out of scrap wood from a Kelsey Theatre set; and Lee Ewashko painted and stained the brooms. The man putting it all together is Dan Mattonelli, who created the overall mechanical design and the plumbing necessary for continuous water circulation. Mattonelli admits to a few sleepless nights as he has worked to create this brand new thing from scratch. “It’s a little nerve-wracking. It all has to last for eight days. I didn’t quite realize what I was getting myself into, but I am enjoying it,” he says. For those in the know, the display will give a subtle nod to MCCC. “The student topiaries will have the Mercer ‘M’ on their shirts and our storybook starts with the “M” entwined in ivy,” Ricco says. 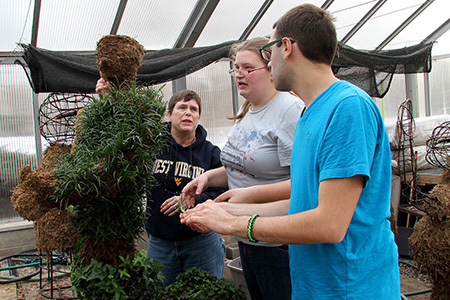 Horticulture Program Coordinator Amy Ricco, at right, with some of her student volunteers in the MCCC Greenhouse. 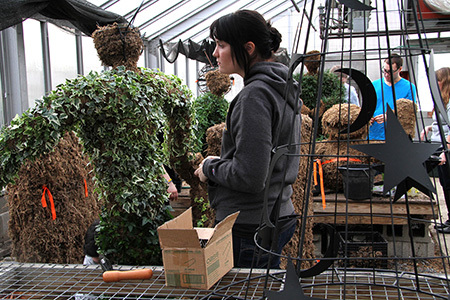 Students, from left, Pam Mills, Nicole Wright and Ed Franczak at work on one of the topiaries. Colleen Wurtz prepares to complete the ivy-covered teacher topiary. At right is the magic hat. From left, Facilities volunteers Dan Mattonelli, Bob Bowman, Lee Ewashko and Rich Miller. The college’s efforts have gotten the attention of WPVI-TV, the ABC affiliate in Philadelphia. 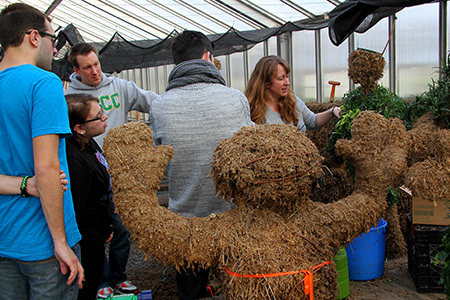 Producer Amanda Brady visited the MCCC greenhouse on Feb. 12 to interview Ricco and her students. Mercer will be featured on "FYI Philly" in a half-hour Flower Show special that will air at 7 p.m. on Feb. 28, the show’s opening day. The show runs through March 8. Ricco is grateful to everyone who is adding their time and expertise to the project. The group will transport the display to the Philadelphia Convention Center starting Feb. 23. “This is a huge project, but it’s also a huge boost to our students and our program. As the PFS people like to say, this is the Olympics for people in the horticulture field,” Ricco says. It’s clear that the folks at MCCC are at the starting gate and ready to go the distance.